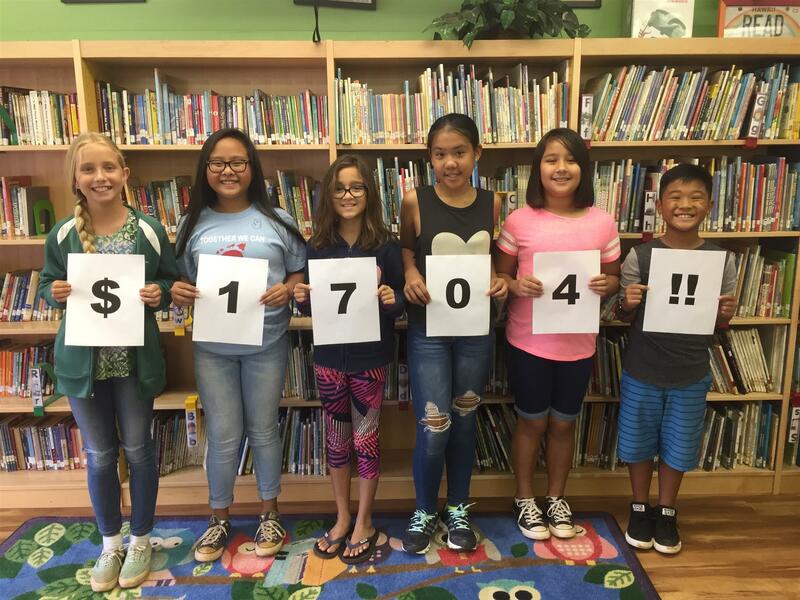 Kihei Elementary Student Council Early Act surpasses last year's "Pennies for Polio" Drive income! The Kihei Elementary Student Council Early Act group consisting of 18 representatives from 3rd, 4th and 5th grade classes celebrated the success of their third Student Council project since November 2017. Member Allen Inda's son, Aaron, is a member of this group. Sponsored by the Rotary Club of Lahaina Sunset this group held the second annual “Pennies for Polio” Drive. Led by staff members Alaina Valite, Michelle Bonilla, and Joanne Laird, the students were introduced to Rotary International’s “End Polio Now Campaign”. Council members made 40 posters for all classrooms and provided collection jars for each classroom. The collection period was for two weeks at the end of February 2018 and a total of $1704.00 was the result of this school-wide effort. Ms. Tehani Kama’s 1st grade class and Ms. Kristen Goodwin’s 5th grade class were the top classes who collected funds for their recess period and they will each receive a Jamba Juice/Healthy Snack party from the Rotary Club of Lahaina Sunset. Special thanks to Ryan Beenken for securing American Savings Bank Kahului Branch who counted and recorded all of the coin and currency collected by the 36 classes. And a big special thanks to Foundation Chair Phylecia Platte for taking all of the jars of coin to the bank for counting and providing American Savings Bank with a thank you gift of Starbucks gift cards! The Student Council will keep ¼ of the collected funds for future projects and the remaining funds has been sent to Rotary International’s “End Polio Now” campaign and will be matched 2-1 by the Bill and Melinda Gates Foundation. The council members were surprised to learn that Polio is a disease that killed and crippled so many children in the 20th century. Upon learning about this effort all council members were eager to take part in the project to help Rotary end this disease in the world. According to Student Council Adviser Joanne Laird, “The students embraced this project and experienced first-hand the meaning of the Rotary International motto of “Service Above Self”.